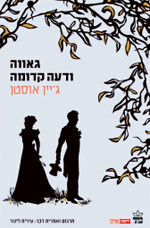 I read a fantastic post about someone re-reading Pride and Prejudice in Hebrew last year, and the way the experience of the book differed due to the language. It also mentioned that ‘Hot’ (an Israeli cable provider) was adapting P&P and putting it into modern day Israel (which reminds me of Gurinder Chadha and her Bollywood Bride and Prejudice). A six-part mini series in Galilee, Elizabeth Bennet is transformed into Alona Sadeh (Yael Hadar) while Mr. Darcy becomes Nimrod Artzi (played by Dan Shapiro, also written ‘Shapira’ in some articles). However it is no simple transformation, and many changes were made along the way.